Provide comfort for the family of Donald Hugh Shiflet with a meaningful gesture of sympathy. Donald Hugh Shiflet passed away on February 17th, 2019. Don was born in Bloomington, Indiana on January 11th, 1926 to Harold and Dorothy Shiflet. He was a life-long resident of Bloomington, residing in the same house he was born in for all but the final 2 years of his life. Don was a 1944 graduate of Bloomington High School where he lettered on the varsity basketball team. 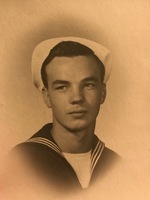 Upon graduation, Don enlisted in the United States Navy where he served time aboard the USS Santa Barbara during World War II. After arriving home from the Navy, Don married Ruby Carmichael on June 28th, 1947. They went on to have 3 children, Ron, Debbie, and Tammy. Don and Ruby would raise their family in his boyhood home on West Howe Street, a common stop for the kids of the neighborhood who would spend their summers playing in the city park behind the Shiflet home. Don worked in the sporting good sales industry for 53 years, providing athletic equipment to Indiana University and dozens of high schools and middle schools throughout Indiana, as well as countless visitors to his large garage near his home which was always overflowing with sports gear and clothing. Don was known for never turning away someone in need, whether it be new shoes or a new glove or a pair of athletic shorts. His generosity was never forgotten by those he helped throughout the years. One such story told of him is helping out a young high school basketball player whose family could not afford to buy the size 16 shoe he needed to compete. One day after practice, Don made the comment that a pair of size 16 shoes was on the bleachers and if he left and came back and they were gone, well then, they must have found a good home. The young man took him up on that offer for those shoes. That young man went on to become none other than Larry Bird, one of the all-time greats in the sport of basketball and an Indiana Legend. Alongside his career in the sporting goods industry, Don was a pioneer in youth sports in Southern Indiana. He was responsible for the launch and development of Little League and Babe Ruth baseball programs in Bloomington, Unionville, Eastern Greene, Bloomfield, Spencer, Smithville, and Ellettsville. Partnering with friends Walt Grey and Ed Trexler, Don helped to co-found junior football programs in Bloomington, Edgewood, Spencer, Springs Valley, Paoli, West Washington, North Daviess, Brown County, Monrovia, Whiteland, Cloverdale, and Knightstown. Don had a love for youth sports that opened the door for a countless number of local youth to learn many valuable life lessons through sport. In addition to his work for youth sports, Don also worked as a football and basketball official from 1952 until 1990. Don headed a crew deemed the “Shiflet Football Crew”, which consisted of 4 of his brothers (Jack, Harold, Bill, Bobby) and his son Ron. The Shiflet Football Crew was the only 6-man family officiating crew in Indiana history. During his time as a football official, Don worked 10 sectionals, 4 semi-states, and 2 Indiana State Championships. He also co-founded the Indiana North/South Football All-Star game with Phil Dickens. He was awarded the IHSAA Merit Award in 1984 for his years of service to the Indiana High School Football program. Don also officiated Indiana High School basketball, working 26 sectionals, 20 regionals, 10 semi- states, and 1 Indiana State Championship game in 1974. Don’s legacy of officiating extended to the collegiate level as well. He served as an official for Indiana University football games from 1952-1990. He served as an official for the storied Indiana University basketball program, working scrimmages from 1976-1988 during Bob Knight’s tenure. Don managed the Indiana University Football Chain Crew for 52 years. If IU was playing a home game on Saturdays in the fall, you could find Don at Memorial Stadium making sure the Chain Crew had everything they needed and cheering on the Hoosiers! Perhaps Don’s most prized accomplishment in his career was being inducted into the Indiana University Sports Hall of Fame for his years of service to the football program. Don served on the Bloomington Softball Commission for 18 years, and was a supervisor at the local parks for 38 years. He was inducted into the Indiana Softball Hall of Fame in 1986 followed by induction into the Bloomington Softball Hall of Fame in 1987. A favorite of the players, Don was always doing his part to make sure players had the best equipment available as well as uniforms. Field 1 at Twin Lakes Sports Complex was renamed Don Shiflet Field in his honor for his years of service to the softball community. Don spent many years in the later part of his working career at the Indiana University Hper equipment room. He could be found making small talk and cracking jokes with students checking out equipment while also visiting the many friends he made throughout the Hper building. Don was always a welcome face during his years of service. In 2011, Don was part of the first ever induction class into the Monroe County Sports Hall of Fame. He was the first person ever given the Contributor Award for his years of service to the sports culture in and around Monroe county. Don is survived by his 3 children: son, Ron Shiflet (Mary); daughter, Debbie Cross (Bud); and daughter, Tammy Brannon (David). He also leaves behind grandchildren: Tisha Granger (Todd), Jaime Shiflet, Tim Cross (Samantha), Kayla Shiflet, Kelsey Pearson (Erik), and Courtney Cross (Jarred). He leaves behind 6 great-grandchildren: Cole Granger, Abbie Granger, Anna Claire Granger, Brooklyn Shiflet, Ruby Cross, Brigham Cross, and great-grandchildren-to-be: Easton Pearson (due March 2019) and Harper Mason (due May 2019). He is also survived by siblings Barbara Butcher, Lois Stephens, Robert Shiflet and Bill Shiflet. Don was preceded in death by his wife of 67 years, Ruby, in July 2014; his parents, Harold and Dorothy Shiflet; and brothers, Harold (Junior) Shiflet and Jack Shiflet. The family would like to thank Stonecroft Health Campus for their care of Don over the last few years. They would also like to thank Southern Care Hospice for their diligent care in making sure Don’s journey was comfortable. There will be a viewing for friends to pay their respects on Sunday, February 24th from 2-5pm at The Funeral Chapel in Bloomington. A small service officiated by Jeff Winters will follow at 5pm. A private burial with family will be held at Valhalla Memory Gardens. In lieu of flowers, you can make a donation in Don’s memory to the Don Shiflet Memorial Scholarship that will help fund the needs of Youth in Monroe County through sports. Contributions can be made by writing a check to the Bloomington Parks Foundation with “Don Shiflet Scholarship” on the memo line. Don’s family could think of no better way to honor him than continue his support of youth sports in Monroe County. We encourage you to share your most beloved memories of Donald Hugh here, so that the family and other loved ones can always see it. You can upload cherished photographs, or share your favorite stories, and can even comment on those shared by others.